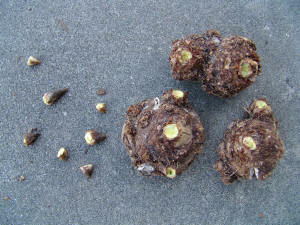 Various techniques have been used in the past to finish caladiums that have a more compact habit with more leaves. 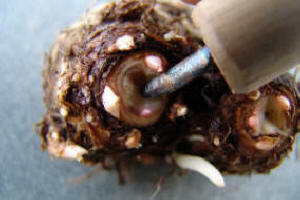 Terminal bud removal or de-eyeing, is the most reliable way. Individual varieties respond differently to this procedure, with some showing no appreciable affect from the procedure. 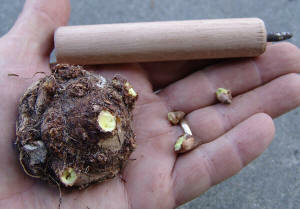 To de-eye, cut out the terminal/dominant buds or sprout(s) (eyes) using a small knife or tool pictured above. 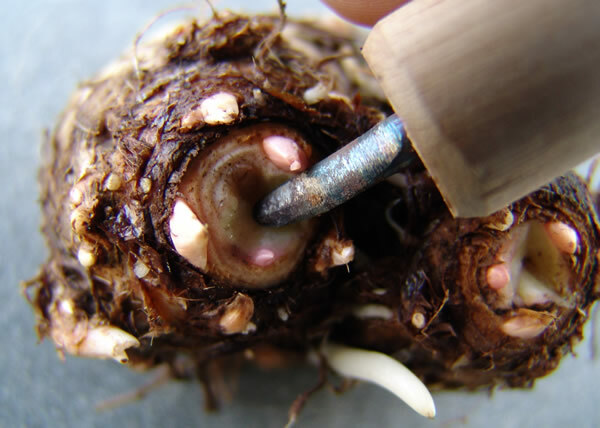 Staying within the diameter of the eye, remove the entire eye by cutting about 1/8” - 1/4” deep into the bulb. Remember, it is critical to stay within the diameter of the eye to eliminate damage to the small eyes (axillary or lateral buds) that surround the perimeter of the main eye. This is demonstrated first with a green bulb where the axillary buds are clearly visible. Experiments using a nail to puncture and destroy the terminal bud have shown good results. Remember in order to be effective, the de-eyeing method must remove or destroy the terminal buds. 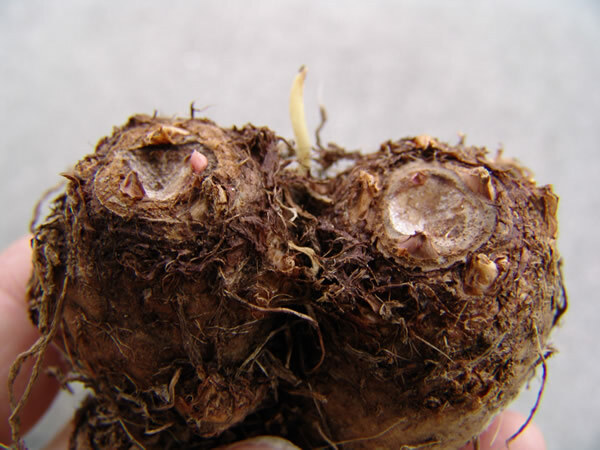 Please note however while proper de-eyeing increases the uniformity of your crop, increasing the severity of the de-eyeing treatment, by excessive removal of tuber tissue surrounding the terminal eyes, leads to a less uniform crop. 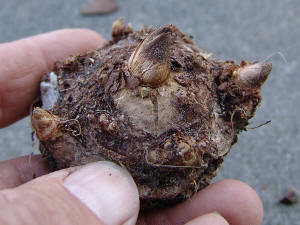 Cluster bulbs, those with four or five terminal eyes, generally do not benefit from de-eying. Contrary to some beliefs, it is not harmful to de-eye white cultivars as long as it is done properly, e.g. stay within the diameter of the terminal eye. 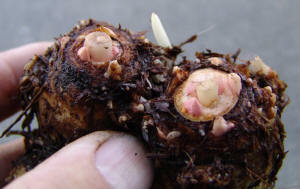 The caladium bulb, being a storage organ, is full of carbohydrates. A wet carbohydrate source invites disease problems, so it is best to let a de-eyed bulb dry and heal 10-12 hours before potting. Use a fungicide or Talc dust to aid in this process may be helpful. Good air circulation is very important to this drying (healing) process. 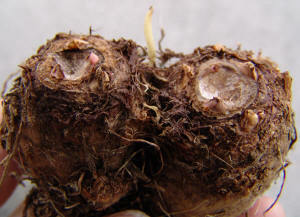 The apical (terminal) shoot (bud) is more mature than the axillary buds surrounding it. After de-eyeing, shoots/leaves from axillary buds may have a slightly different (more juvenile) look and color. Although de-eyeing will delay the forcing time briefly (up to two weeks), it will result in a fuller more compact plant. Therefore, we recommend that all bulbs used for pot plants, except as noted in the variety descriptions, be de-eyed. We do not recommend the use of GA on caladiums to stimulate germination as it causes excessive stretching (petiole elongation).